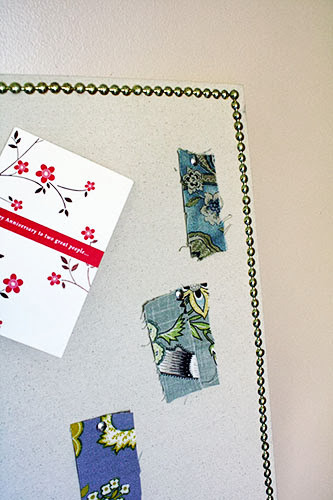 Yesterday I left you hanging after telling you about the unfortunate blue bulletin board. I’m honestly not exactly sure what I was thinking. Since when have I ever wanted a giant block of bright color on the wall? And besides the color, I cannot even convey to you how icky it looked. I had hoped to cover up the well-used (a.k.a. beat-up) surface with paint, but forgot the cardinal rule that rough surfaces require a flat paint, and my paint had a sheen to it. All the bumps and holes looked even worse in a shiny, odd blue. Months later, I’m still, just... yikes. Neutral? Texture? A bit of shiny? Now THAT is singing my song. So off I went to Hancock Fabrics to find some linen-like neutral fabric to cover that whole blue disaster. I chose not a true linen, but a heavier canvas-y type of cotton. I liked it best because it had little darker specks in it, which would disguise future pinholes (as opposed to a perfectly uniform fabric where a small hole could stand out). The weave was also not super-tight, so it seemed like pinholes wouldn’t show much anyway. 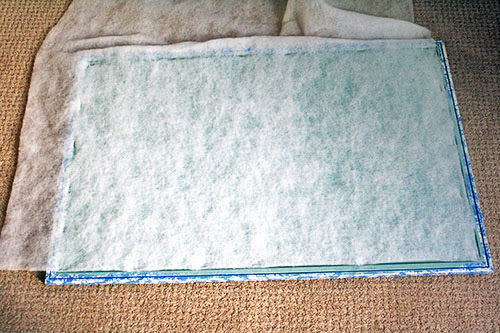 It was something like six bucks a yard, and one yard was plenty to cover this large corkboard. Oh, and I also picked up a yard of cheap quilt batting, to help disguise the wooden frame under the fabric. 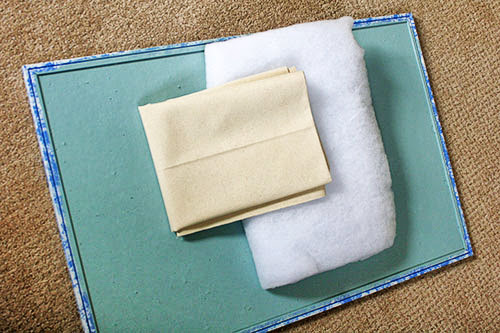 I started by pressing out any wrinkles in my linen-like fabric. That meant ironing it really really well. Don’t want those in the finished product! 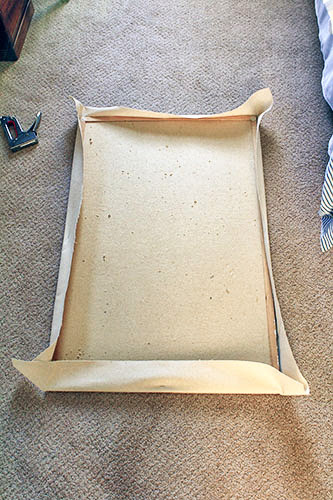 While the press set in the fabric, I started attaching the batting to the corkboard. I just stapled it into the cork, right up against the edge of the frame. No fancy staple gun needed, my Swingline did just fine! I trimmed the excess once the staples had secured it, and it was good to go. Then I just stapled all around, pulling it tight as I went. The corners got a bit of special treatment – fold it down one way and staple, then the other and staple, and then in the middle and staple. It looks fancy, but it’s pretty straightforward. 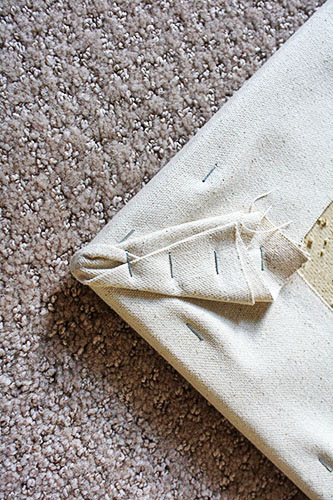 Once the fabric was attached, I needed nailheads! 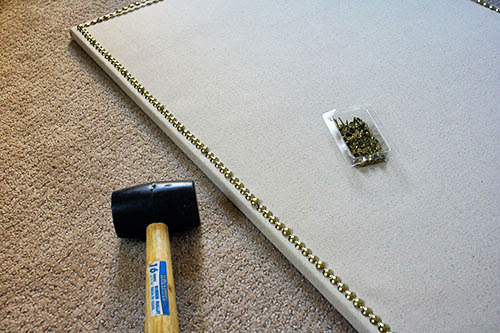 Specifically, I wanted the faux nailhead trim, where you only attach every fifth nail. Freckles Chick spaced out real nailheads, but I wanted a true continuous line of blingy nailheads, and I figured the faux trim would be the easiest way to do it. Less hammering, less freaking out about perfectly spaced nails and perfectly straight lines. 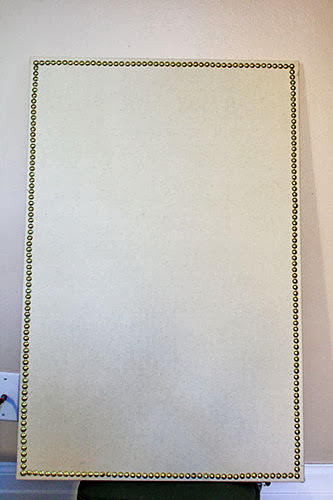 Faux nailhead trim was my way to go! Just one problem: that stuff is freaking expensive. I found it at Hancock Fabrics when I bought the linen-like stuff, but five feet of the trim was over twenty bucks. And I wasn’t even sure I’d like the linen cover! Even when it turned out nicely, that still seemed like a lot to pay just for a dumb bulletin board. 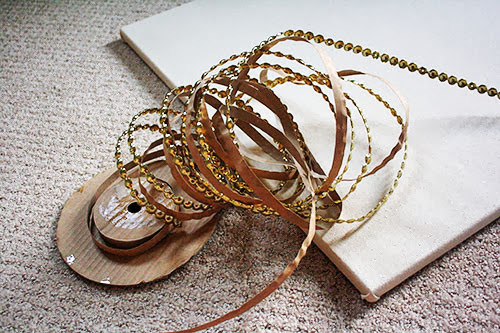 But then... the grocery store wanted me to have nailhead trim. For real. 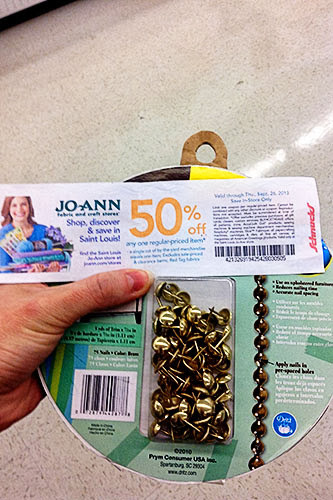 The register at Schnucks spit out this 50% coupon for JoAnn Fabrics, which also happened to have the same nailhead trim. For half price, yes! 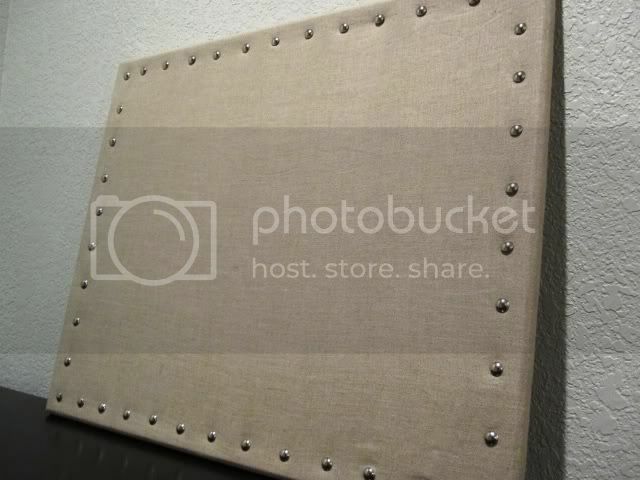 I will have nailhead trim! Totally meant to be. 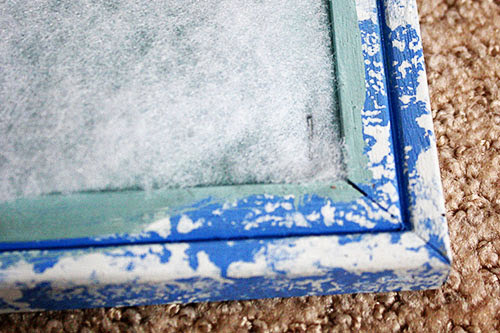 Now, as I said, I wanted the faux trim because I figured it’d be easier. That does not, however, mean it was easy. Attaching the trim was not as quick as I’d hoped – it still took a lot of time to line it up, and the nails kept bending when I hammered them in with my rubber mallet. There was definitely some swearing involved. But again, it was certainly easier than the alternative! And the finished result turned out so nice! A little messy up close, but it totally looks fine from afar. The beige linen didn’t totally clash with our walls. 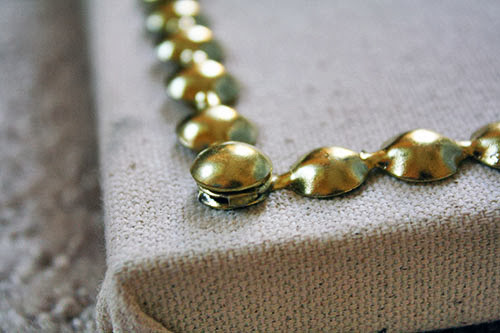 The blingy gold nailheads are just my style. The lines turned out straight, and the wonky nails aren’t too obvious. And now I have a place to pin my samples-of-expensive-fabric-I’ll-never-purchase with wonderfully mixed metal thumbtacks! Probably a grand total of two hours. 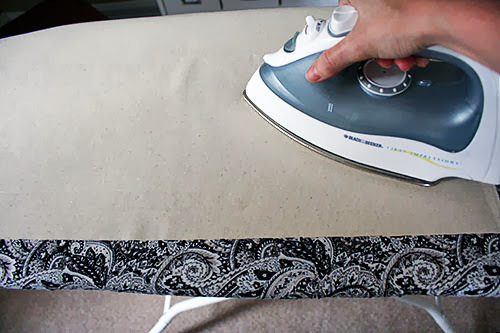 Ironing and covering the board with batting fabric took under a half-hour. Nailing in the trim took considerably longer – over a half-hour just to get the trim lined up, cut in the appropriate places, and corners secured. And then nailing in the rest was a daggum chore. 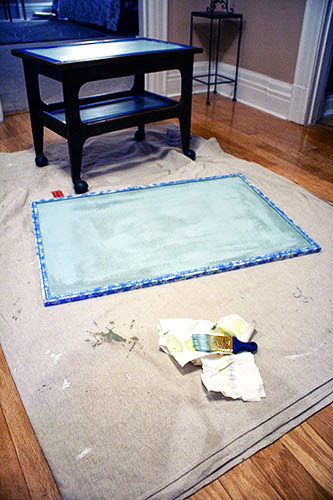 I’ve done cheaper projects, and it’s possible that I could find something similar at a HomeGoods for a similar price. But $20 for something large, lightweight, and personal to hang on our walls is pretty cheap, compared to other “artwork” I could use. Not bad at all! This is one of a few projects I’ve got rolling in our office, which still looks like a room without much style or purpose. Hopefully it’ll come together in the end! Very stylish - and a recycle redo, too! I really like it!